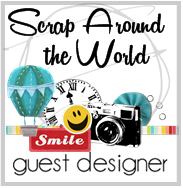 It saddens me to leave the Scrapmatts Design Team. 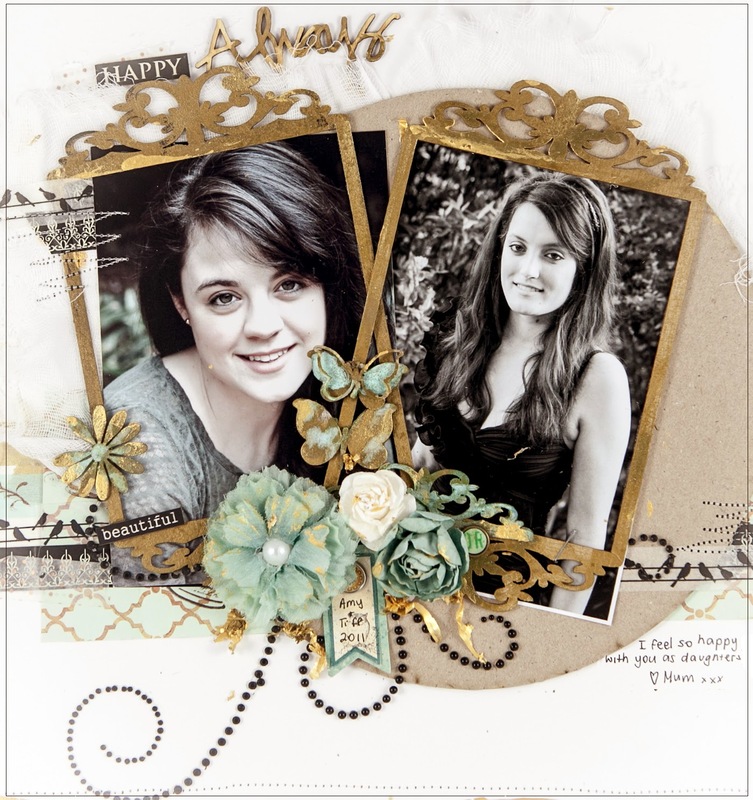 For two years I have really enjoyed working with Sofie and Andrew and their wonderful chipboard designs. It has felt so good creating along side the other team members who are a constant source of inspiration and good friends. But all good things must come to an end. 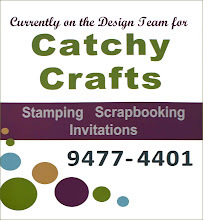 I am on the Heartfelt Creations DT, on-line team for Scrapbooking Creations and the design display team at Catchy Crafts. I work as a Science teacher and really enjoy going to the gym and taking photos - so something had to give. I was having a play with some metallic gold paint and copper patina and I felt it was appropriate to use these on my Scrapmatts frames, flowers and butterflies. 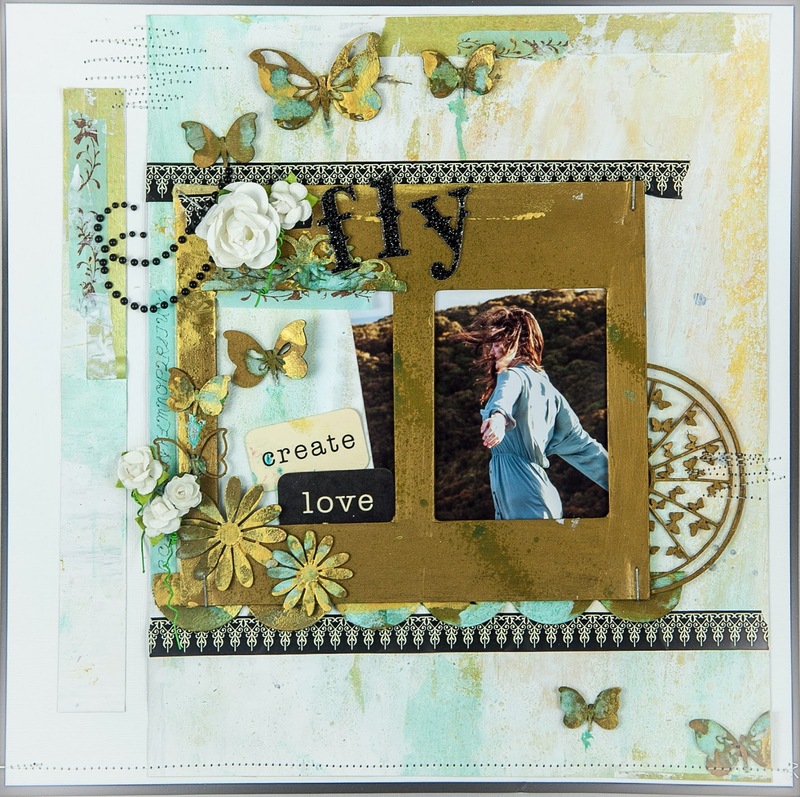 The LO below is my last one as part of the Scrapmatts DT so I tried to make it really special. I love how the paint and finishing solution transformed the chipboard to make it look like aged metal. This post is also special as it is the 100th and final for 2013. Happy New Year and look forward to seeing you in 2014. Here is a LO on Amy and Tiff using the gorgeous Delicate Asters Collection by Heartfelt Creations. Have a look at their web site for more amazing inspiration. Basic Gray Alphabet; yellow, pink and clear glitter; bling; versa fine onyx black ink and Brilliance Pearlescent Purple; white bazzill cardstock and sewing machine. 1. 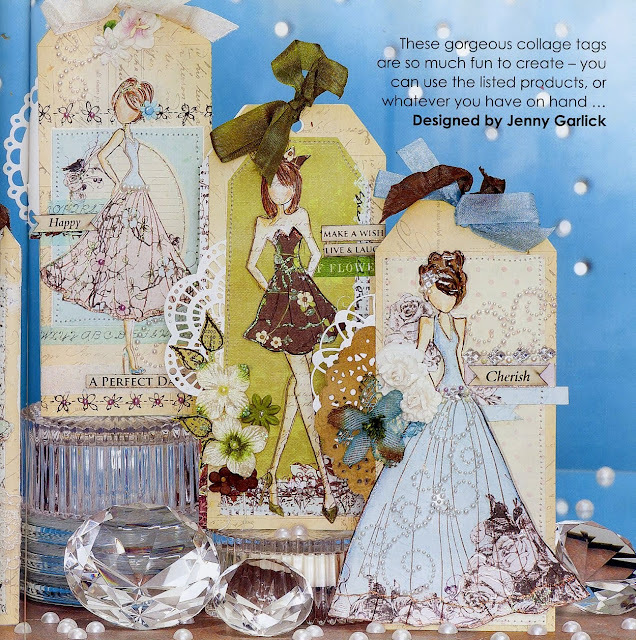 Scrapbook page measures 12” x 12”. 2. 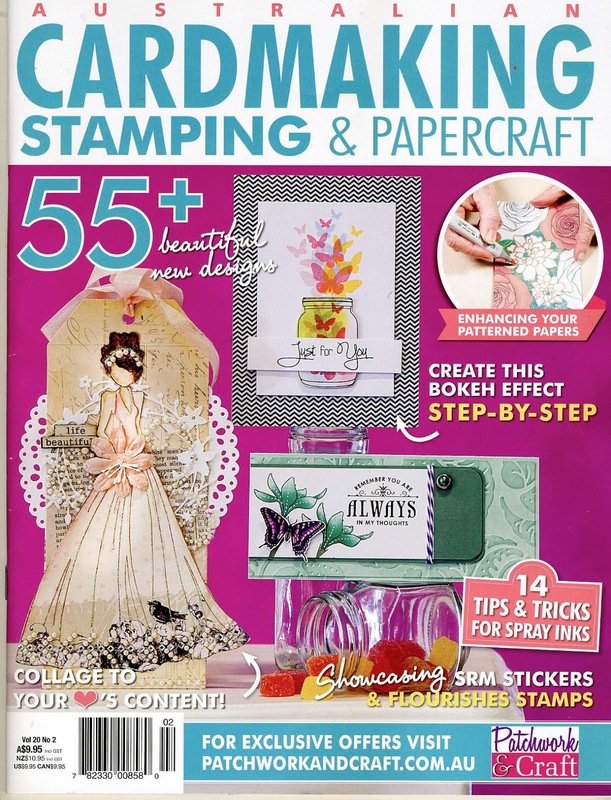 Stamp the leaf stamp seven times onto green paper from the Delicate Aster Paper Collection using black ink. 4. 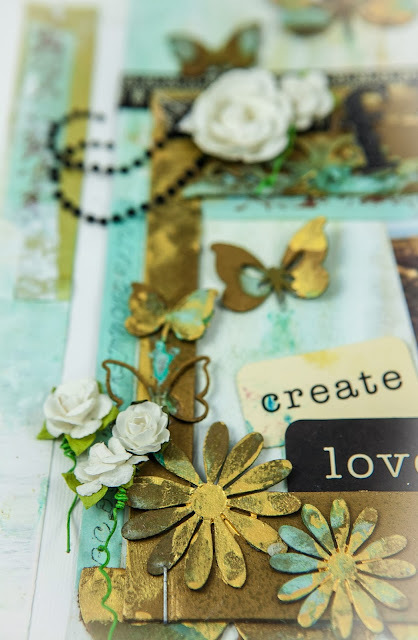 Put the metal tip onto your glue and carefully squeeze thin lines of glue on the details of the background paper shown in the photo and the stamped images. 5. 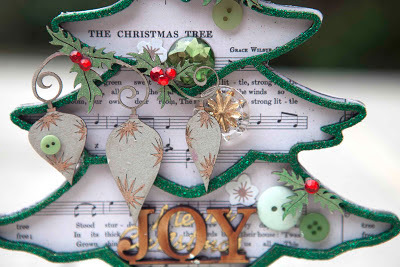 Sprinkle glitter onto the glue and allow to dry before tapping the excess off. 6. 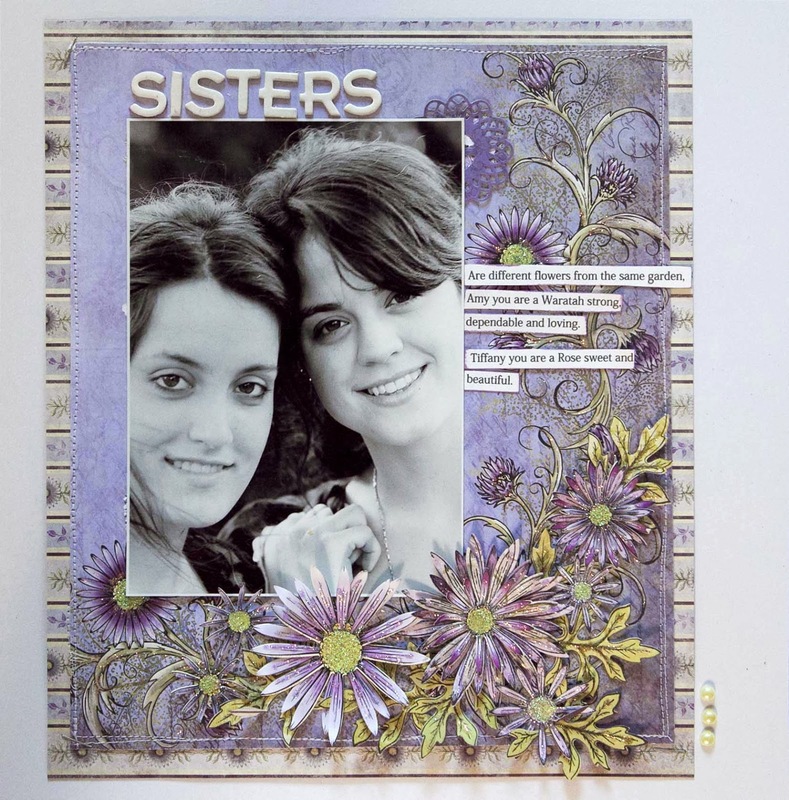 Cut out the flower and leaf stamped images using the corresponding Delicate Aster Dies. Use the cutting machine of your choice. (I used the Big shot). 7. Cut background paper with large flowers 9” (long) by 10.5” (high) and matt onto 10” x 11.5” striped paper. Machine sew around the darker purple edge. 8. Use the molding mat and tools to shape the flowers and leaves so they become dimensional. 10. 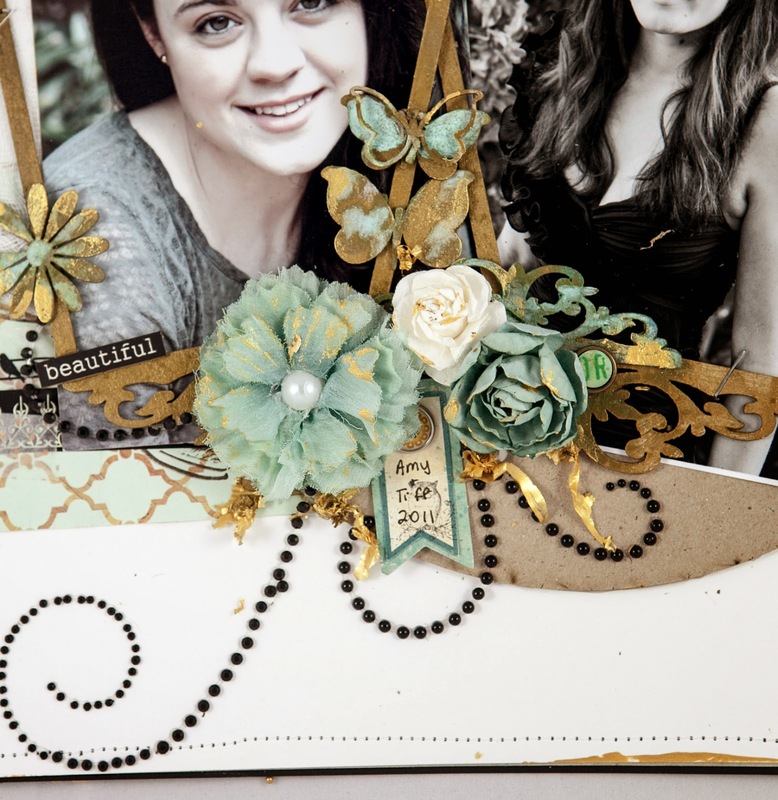 Use foam tape to attach assembled flowers to the coordinating background paper as shown in the photo. 11. Add 4 smaller single flowers to the floral cluster. 12. Add glue to the end of the leaves and tuck the foliage under the flowers. 13. 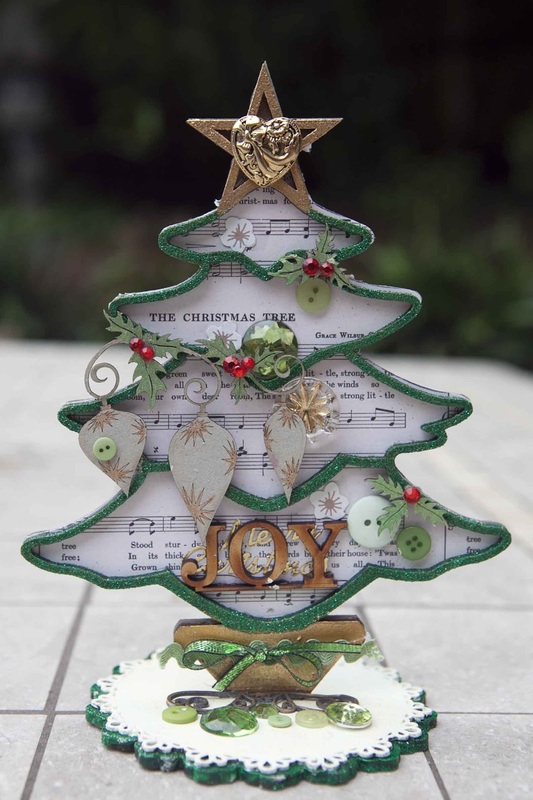 Carefully add a circle of glue to the flower centers and add a generous amount of yellow glitter. 14. Computer generate the journaling and print onto white bazzill. 15. Cut the text into strips and ink edges with Brilliance purple ink. 16. Add 7 x 5” photo. 17. Add title to the top of the photo and add journaling strips down the right hand side of the photo. 18. Staple the four corners of the purple paper and add three pearl dots to the bottom right hand side. 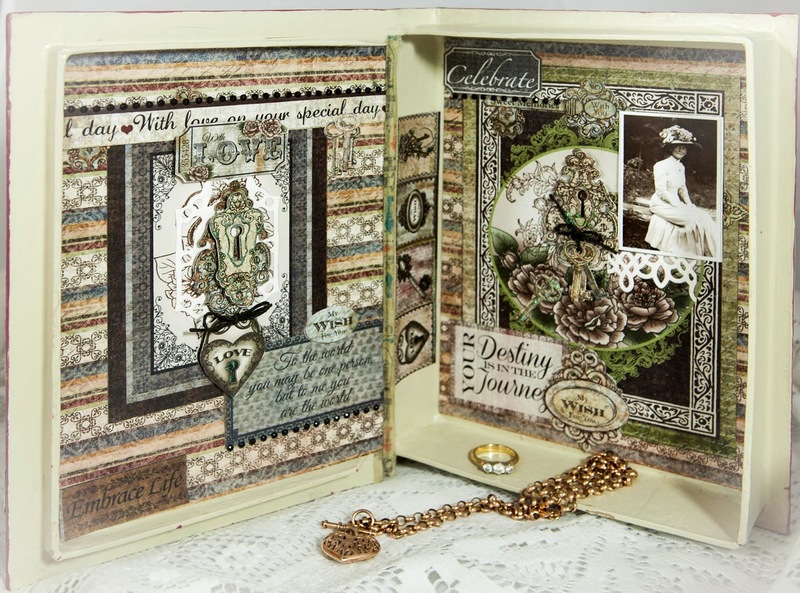 My Vintage Trinket Holder using Heartfelt Creations 'Floral Keys Collection'. This week I made a Vintage Trinket Holder from a paper mache book using the Heartfelt Creations 'Floral Keys Collection'. The warm browns and rich red maroons of the papers were just perfect for the task. Please check out the Heartfelt Creations web site for a closer look at their amazing range of products and galleries. 2. Paint the spine of the book and edges with Pink Plum and the inside with smoked pearl. Jo Sonia paints are Australian. Use equivalent colours if necessary. 3. 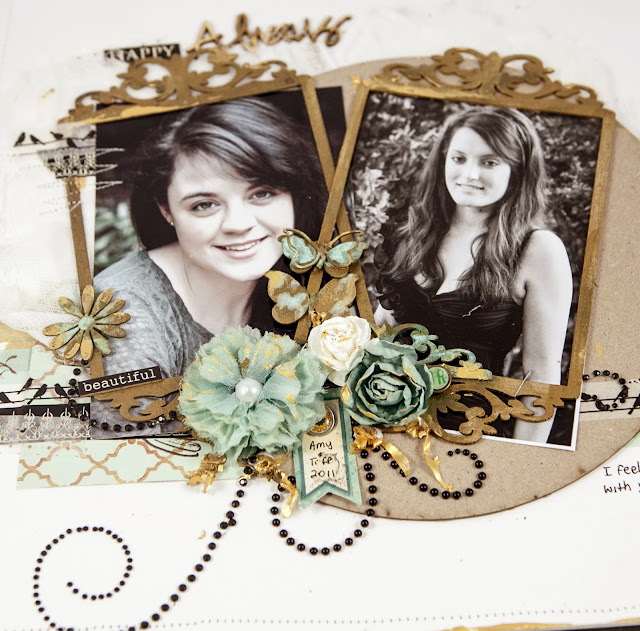 Using papers from the Floral Keys Collection and the photos as guides cover the inside and outside of the book. 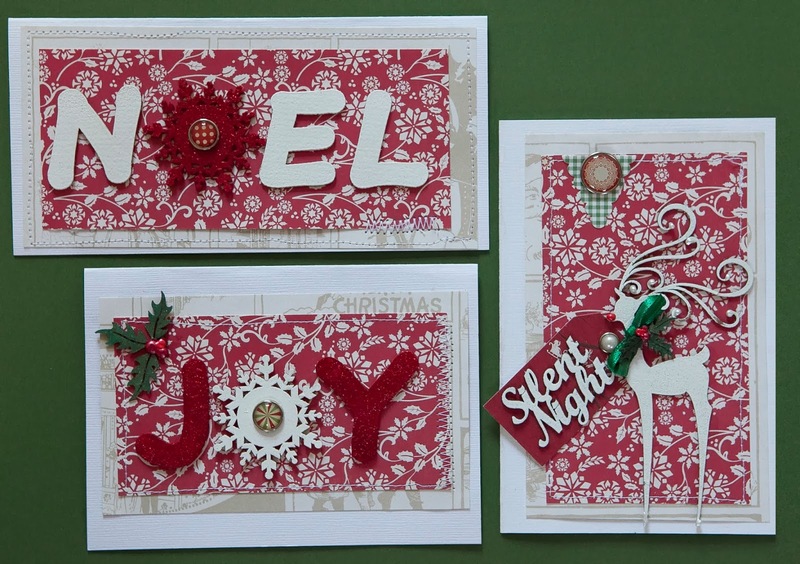 Be sure to cut out the trims, word tickets and other embellishments in the paper range as shown. 4. 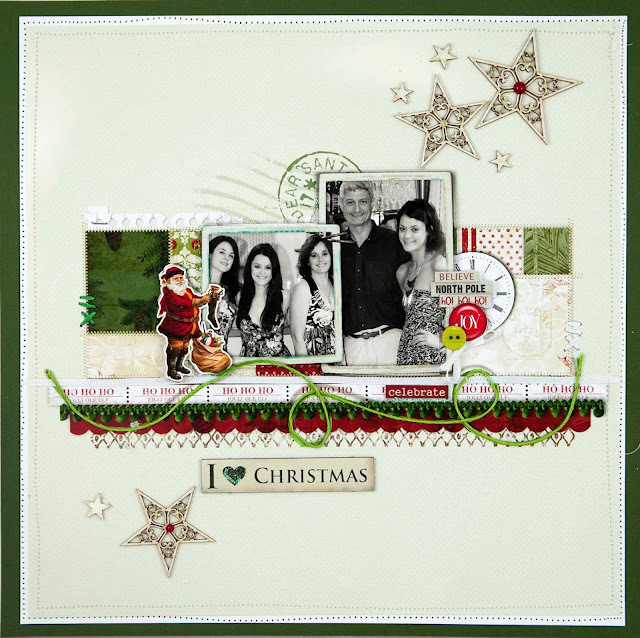 Stamp HCPC 3569 Burnished Key PreCut Set 3 times and cut out using HCD Burnished Key Die. 5. 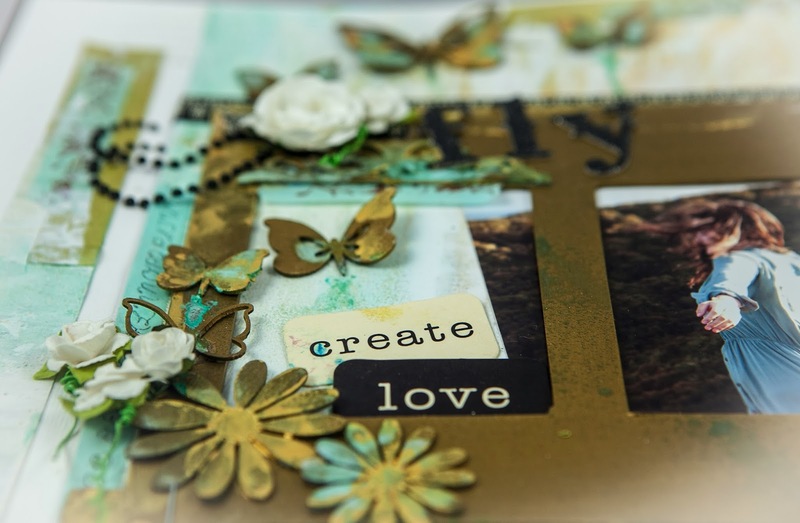 Use the metal glue tip on the Art Institute glue to outline details on the keys, locks, flowers and hearts. 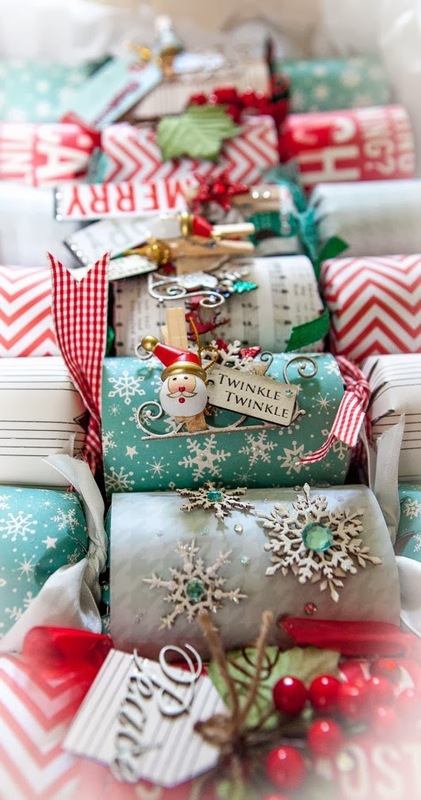 Sprinkle clear fine glitter on and allow to dry. 6. Cut out three frames as shown in the photo. For the cover insert a photo, inside left - stamp with brown ink the key from HCPC 3574 Journey of Love keys PreCut Set and inside right - stamp with also with brown ink HCPC 3571 Keys and Roses PreCut Set. 7. Using white cardstock cut HCD 713 - Decorative Lace Border and Labels 28. 8. Use your cut outs to create the lock clusters on the inside RH and LH side of the book. Use 3D foam tape to add the top layers. 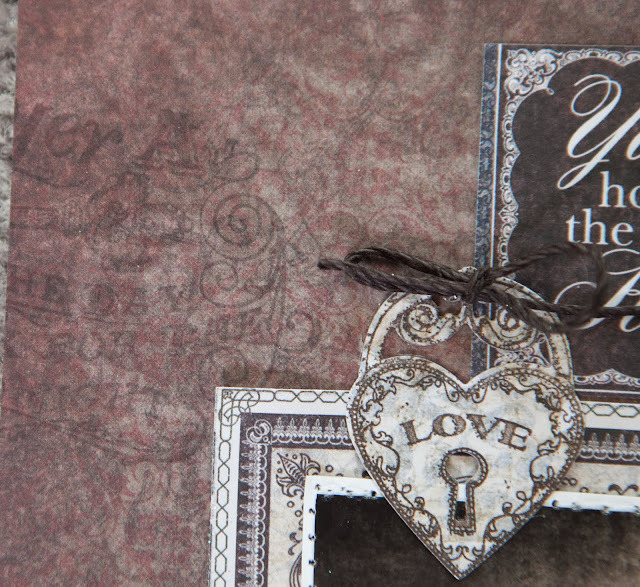 Attach the brown twine to the top of the heart and the keys. 9. Complete the inside by adding the photo with decorative trim and bling. 10. For the cover stamp HCPC 3570 Floral Doorway and Latch PreCut Set twice in black ink and cut out. Use the handle portion from one cut out and use 3D foam tape to layer onto the lock. Create highlight with your white sharpie pen. 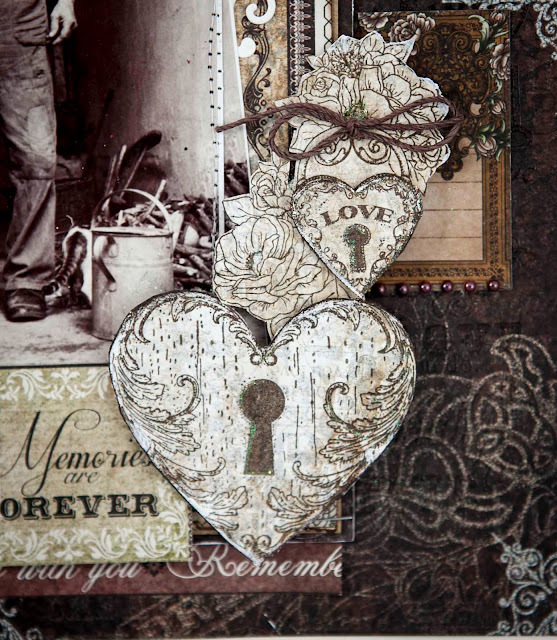 Using 3D foam tape for the heart cluster the keys as shown in the photo and add to the lock and handle complete with two brown twine bows. 11. Layer labels 28 under the photo in the frame and attach to the cover. 12. Add bling and extra heart with brown trim. 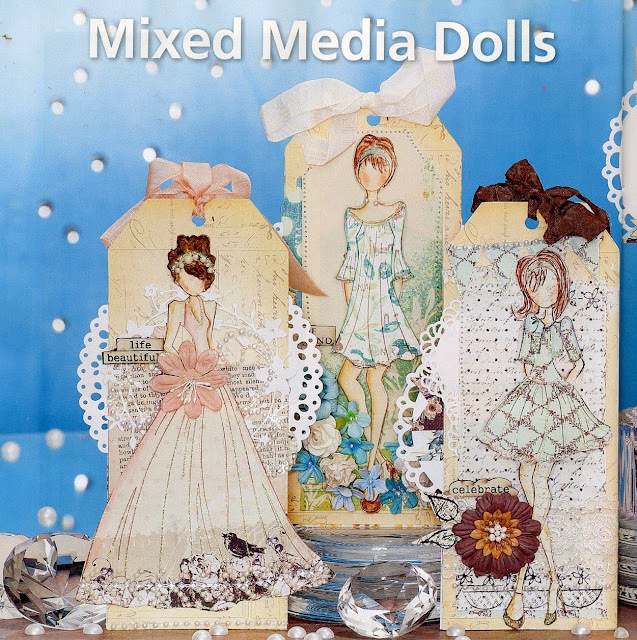 Tip – I found the painted hinges of the book cracked when I opened and closed it so I covered them with coordinating washi tape. 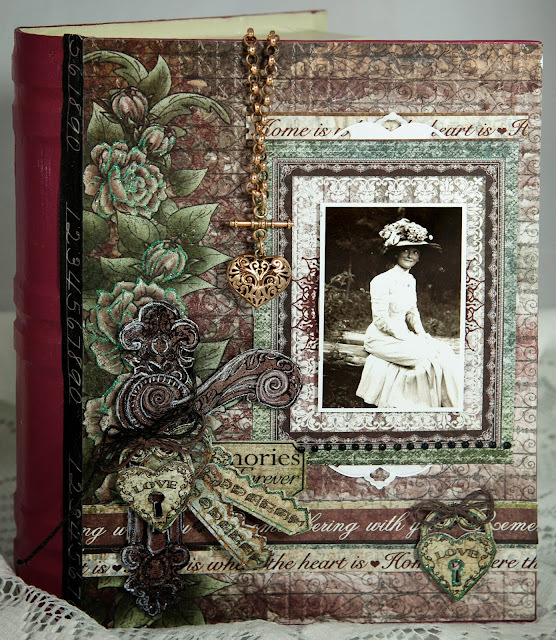 Here is my vintage style LO with a large 5" x 7" feature photo using the stunning Floral Keys Collection by Heartfelt Creations. Visit their blog as the DTs have produced so many wonderful projects for you to feast your eyes on. Below I stamped the image with clear versa mark ink and clear embossed. 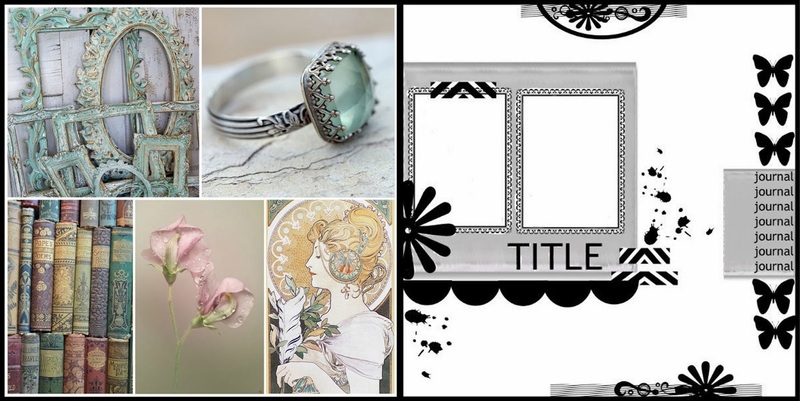 This added a wonderful subtle texture and interest to the layout. I have not used this technique in a long time and I forgot just how much I love it. Other Products used for project other than Heartfelt Creations. 3D foam mounting tape, white bazzill, white paint, Staz On Timber brown Ink and Versa mark Ink, dark brown twine, sewing machine with white thread, white paint, clear embossing powder and acrylic block. 2. Print out two photos 5” x 7” and leave a small border of white around the edges. 3. 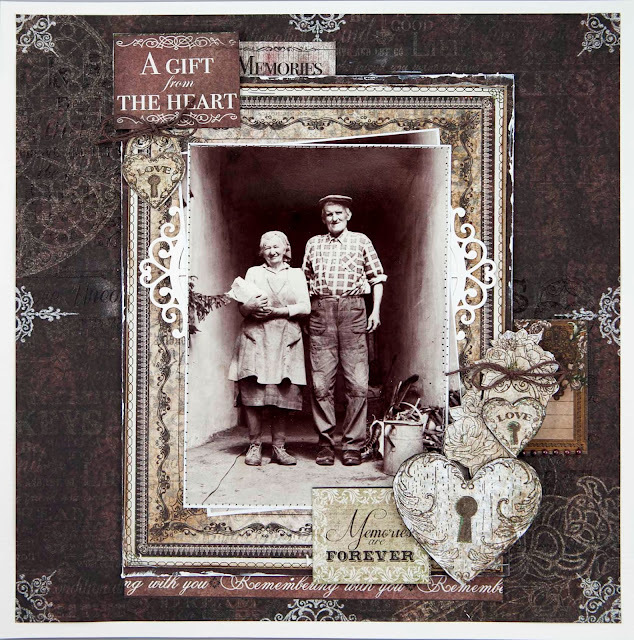 Stamp the large heart from HCPC 3574 Journey of Love Keys PreCut Set and cut out. 4. Stamp the small heart with the floral and leafy background from HCPC 3572 Floral Keys and Locket PreCut Set and fussy cut around the edges. 5. 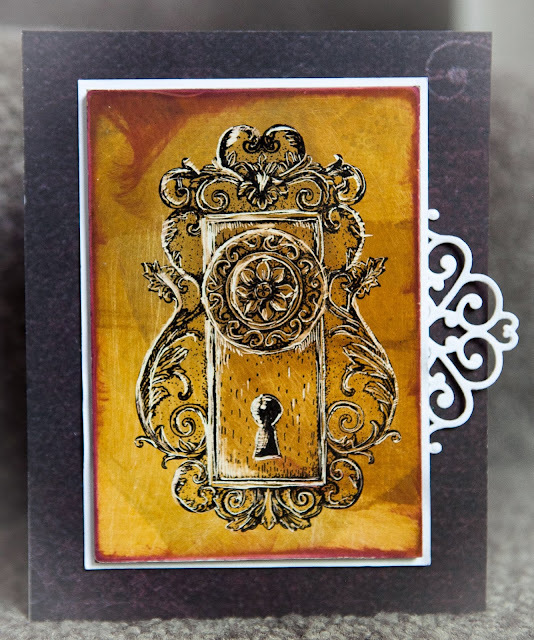 Stamp HCPC 3569 Burnished Key PreCut Set and cut out using the HCD Burnished Key Die. Repeat as you require two small keys. Retain other cut images for future projects. 6. 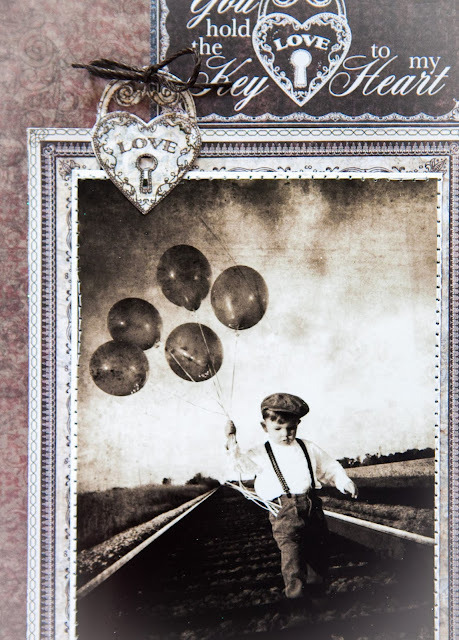 Use 3D foam tape and attach one small heart onto the fussy cut stamped image. 7. Cut brown background paper 11” x 11”. 8. Use clear versa mark ink to stamp HCPC 3575 Script Key Background PreCut Set in the top left hand and lower right hand corners. Heat emboss with fine detailed clear embossing powder. 9. Cut out the large frame from the Floral Keys Paper Collection. 10. 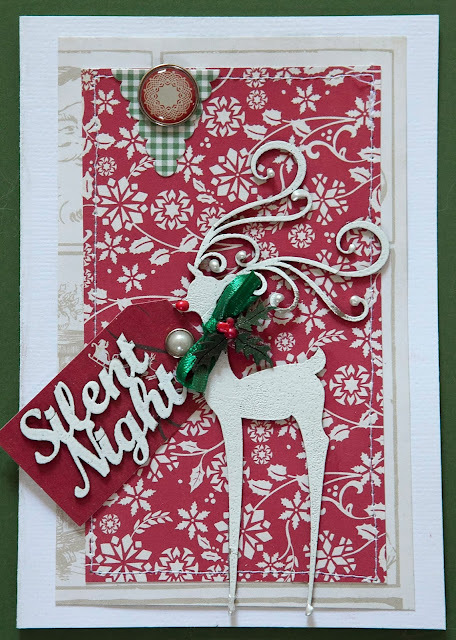 Use HCD 718 Decorative Chateau Gate Die to cut white bazzill. 11. 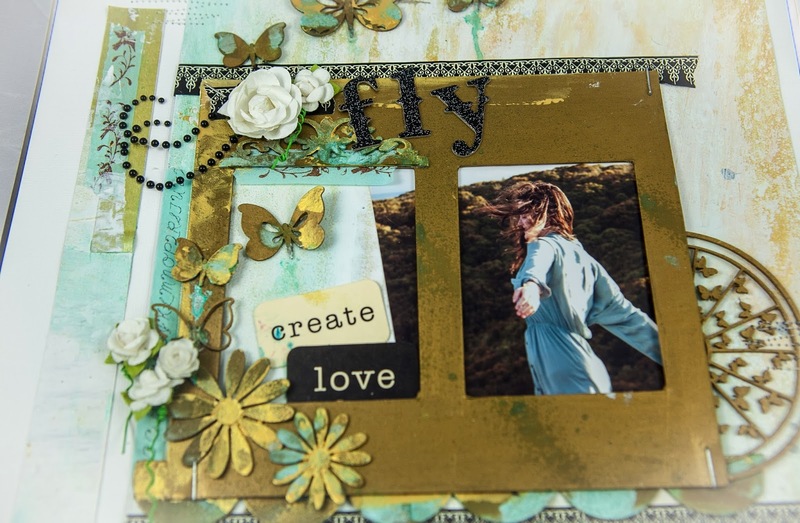 Use the photo as a guide and cut out three sets of words/sayings, the text border strip and journaling card. 12. 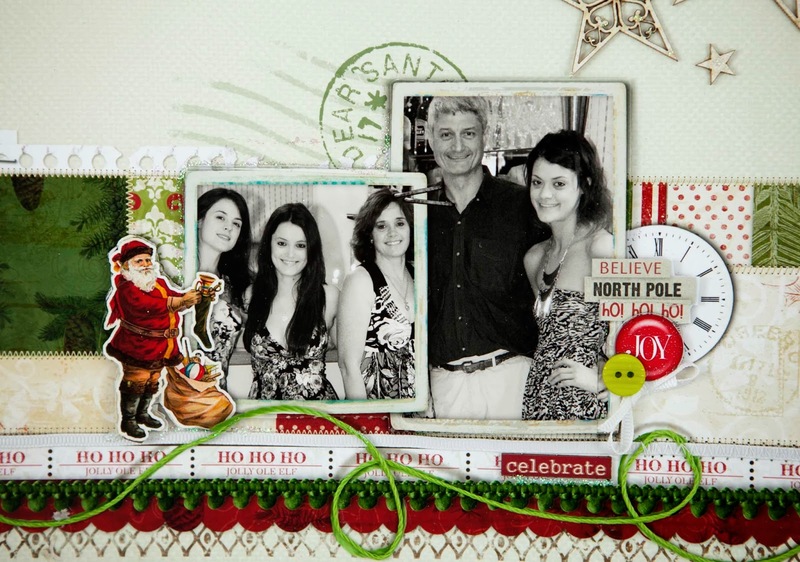 Offset the photos, slide the cut white bazzill decorative cut out underneath and machine sew onto the frame. 13. Mount this onto cardboard to raise the frame. 14. Edge the frame with white paint. 15. Add the heart cluster to the bottom RH corner of the page. I used 3D foam tape to add the large heart. 16. Position all the cut outs as shown in the photo and attach the frame to the LO. 17. Add the second cut out heart to the top RH side of the LO. 18. Tie small bows with brown twine and attach to the top of the heart lockets. 19. Add bling and matt onto 12” x 12” bazzill. 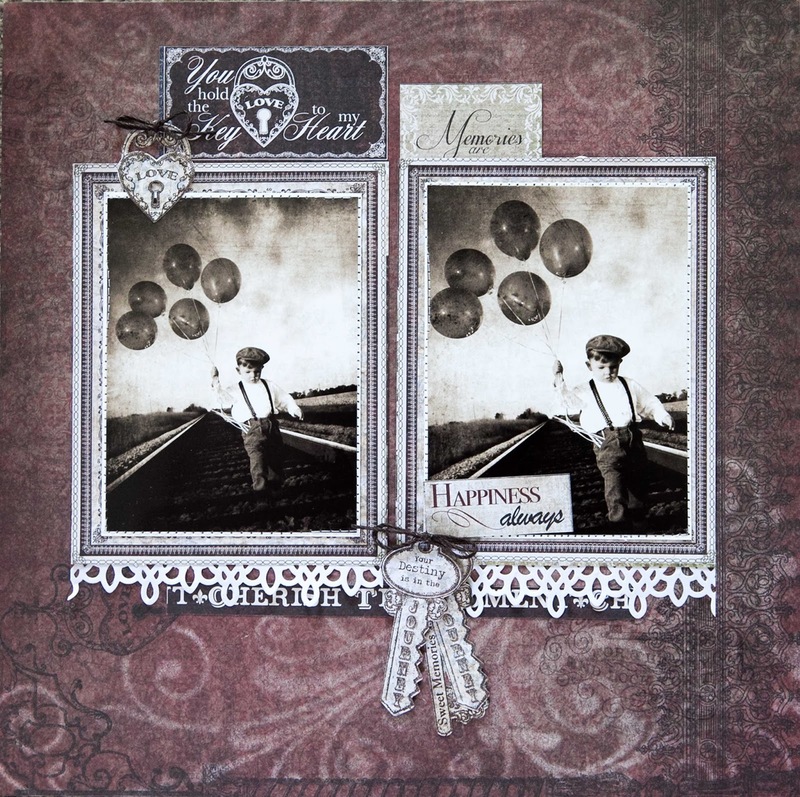 The Floral Keys Collection by Heartfelt Creations works so well with vintage photos as it has the rich palette of maroon and browns. I could not resist making this LO for the Wednesday DT reveal at HFC. Don't you love the gorgeous keys and hearts? I stamped this image with versa fine 'Smoked Grey' and it created such wonderful interest in the background. 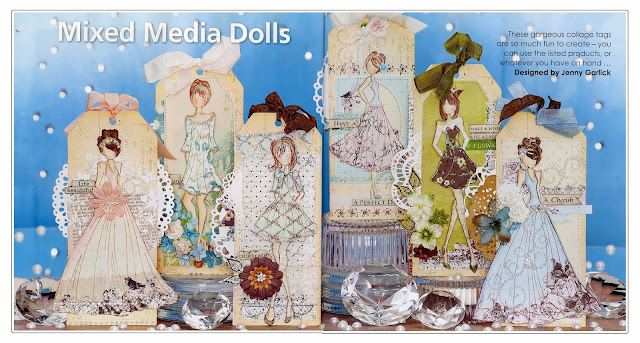 Other Products used for project other than Heartfelt Creations. 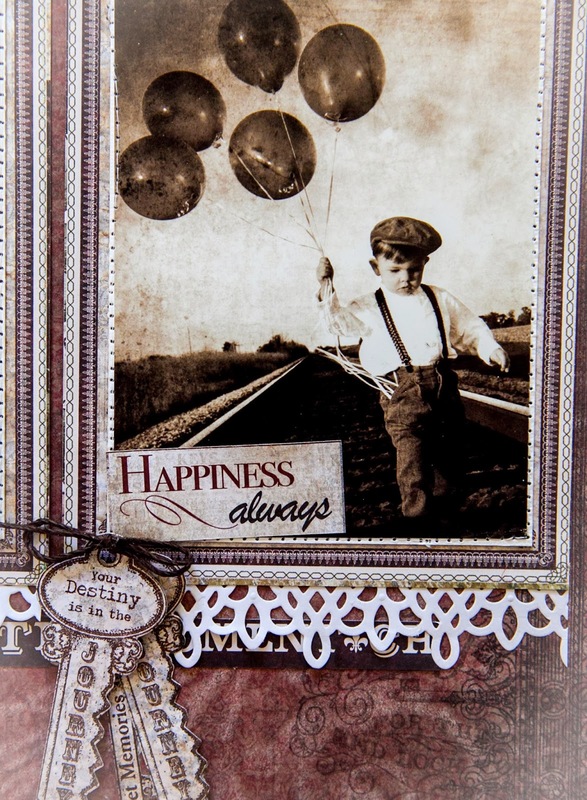 3D foam mounting tape, white bazzill, Staz On Timber brown Ink and Versa Fine Smoky Grey Ink, dark brown twine, sewing machine with white thread and acrylic block. 2. 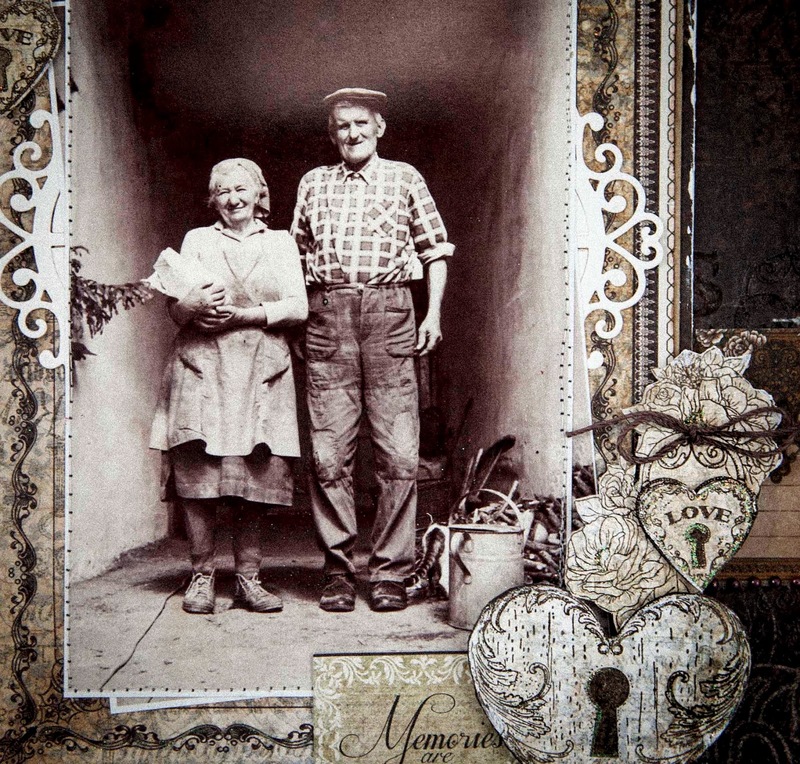 Print out two photos 4” x 6” and trim to fit the frames from the paper collection. 3. 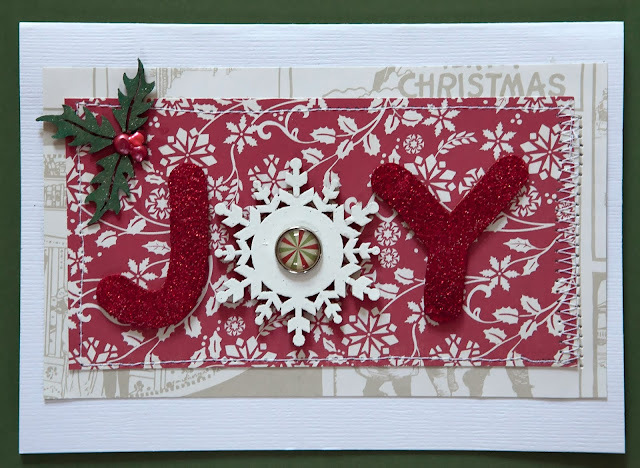 Cut out the two frames and apply a fine line of glue around the edges and sprinkle with clear glitter. 4. Trim down your photos to fit in the frames and mat onto white bazzill so 1/16” paper is framing the images. 5. I also added some scrap cardboard behind the matted photos to raise them slightly. 6. Machine stitch the photos onto the frames. 7. Stamp the Burnished Key PreCut Set and cut out with the coordinating die ‘Burnished Key Die’. Repeat as you need two of the large keys. 8. Stamp the ‘Prayer for the Day’ stamp onto the background maroon paper on the top left and bottom right corners to add subtle interest to the paper. 9. 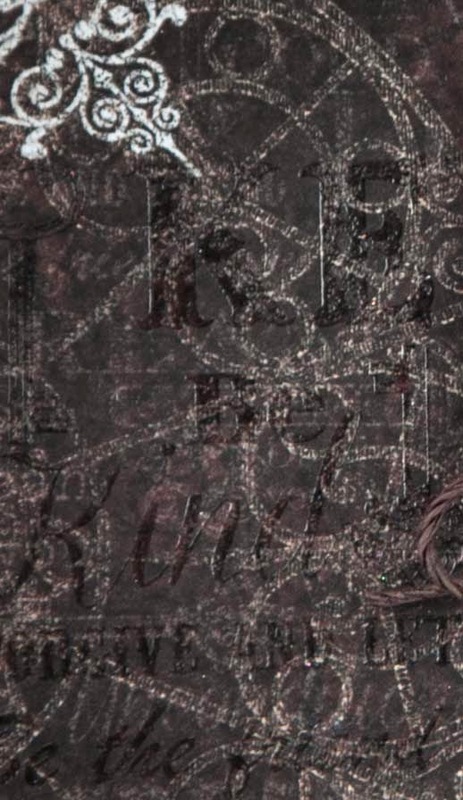 Use the ‘Decorative Lace Die’ to cut white bazzill and layer this under the photos. 10. 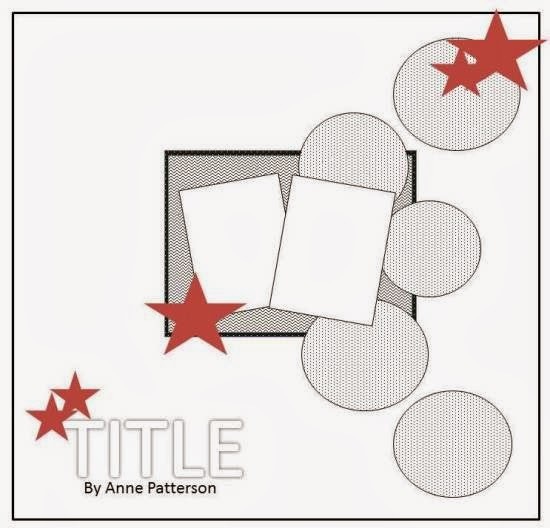 Cut out the words shown in the photo from the paper collection and attach to the layout. 11. 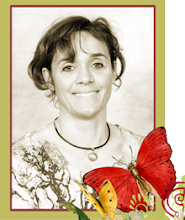 Tie two bows from dark brown twine and adhere to the top of the heart and the large key saying ‘Your Destiny is in the Journey’. 12. Stack your keys as shown in the photo using 3D foam tape to raise the top key.